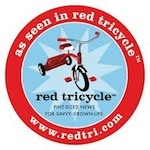 Last updated by suzlipman at March 11, 2011 . As I’m sure many of you know, my family loves cheese, enthusiastically and nearly unconditionally. 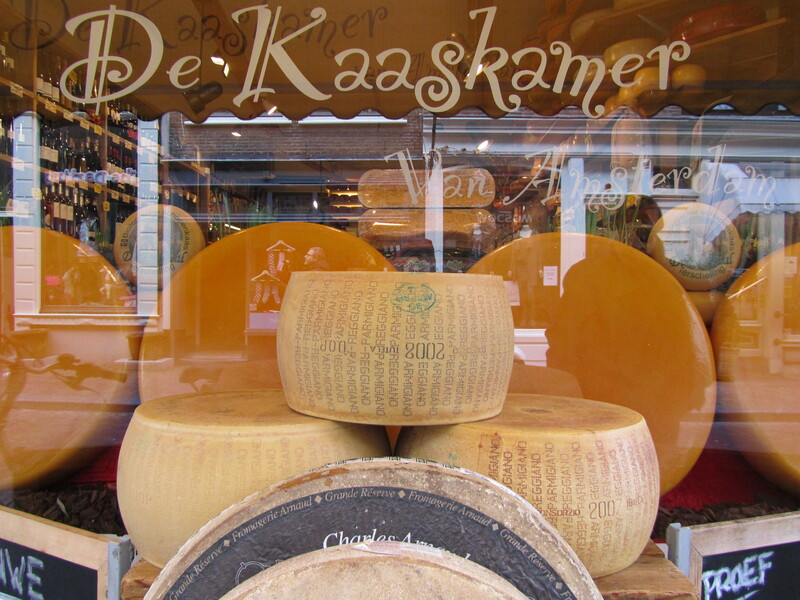 So it was that I flagged De Kaaskamer Cheese Shop in our guidebook on our recent trip to Amsterdam. It turned out I didn’t have to. As if by homing device, we managed to sniff out this haven of cheese (the name translates to “Cheese Chamber”) and spontaneously beeline to it almost the minute our luggage hit the floor of the hotel. We adored much about Amsterdam, as we wandered its pretty streets and canals, admiring antiquarian books and handmade shoes, art, music, beer, and the citizens of Amsterdam themselves, most of whom seemed to roll upright and speedily on two wheels apiece, in all weather and clothing, carrying paintings, floor lamps, babies, friends, and yes, food. 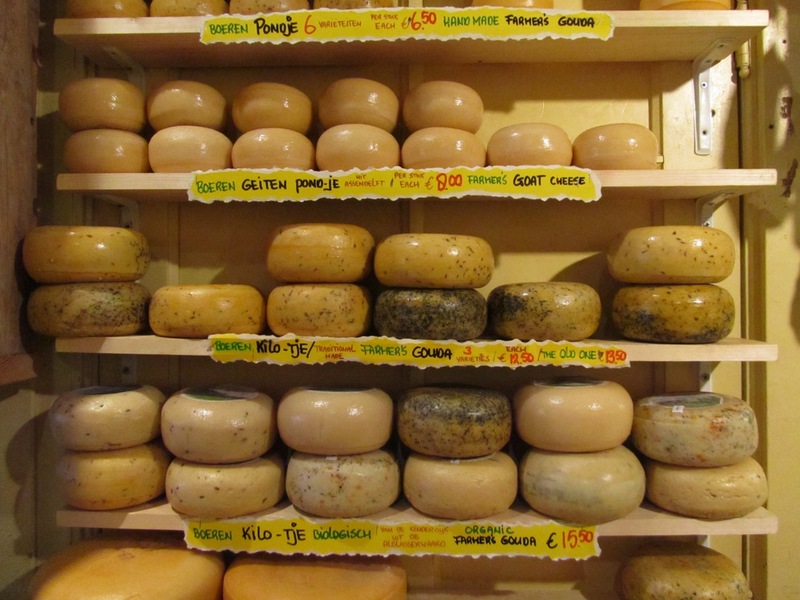 In De Kaaskamer, we sampled Goudas of various ages and a delicious crunchy Beemster, which is very similar to the Saenkanter cheese that is a family favorite. 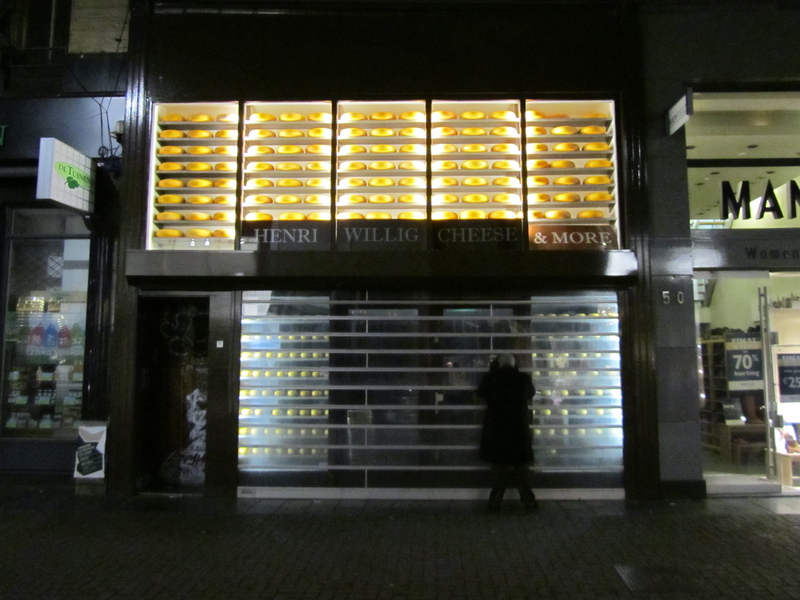 The clerk told us that Gouda simply designates the “wheel” shape of the cheese, rather than a type. Gouda cheese originated from the Gouda region of the Netherlands, but apparently the name is not protected by terroir (place), and all kinds of cheeses can be referred to as Goudas. We satisfied ourselves with visions of pastoral Dutch farmland, portable cubes of wonderful 3-year Gouda, and a large baguette, and took to the Amsterdam streets. Posted in Butter and Egg, Field Trip, Holidays, To Market, Who Moved My Cheese? 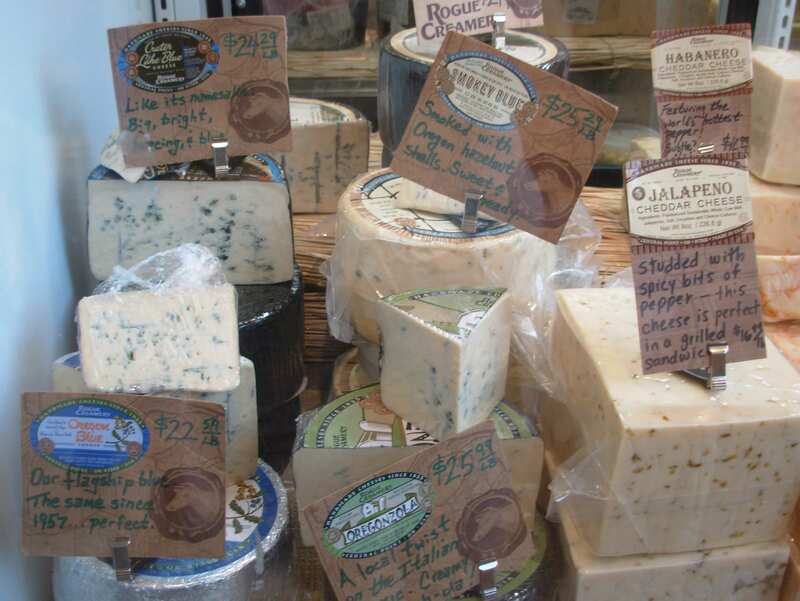 Oregon’s Rogue Creamery and its award-winning Rogue River Blue Cheese just got mentioned in Janet Fletcher’s wonderful cheese column in the San Francisco Chronicle. She also noted Cowgirl Creamery‘s Red Hawk Cheese, which took second place overall in the recent American Cheese Society competition and has won Best of Show in the past. 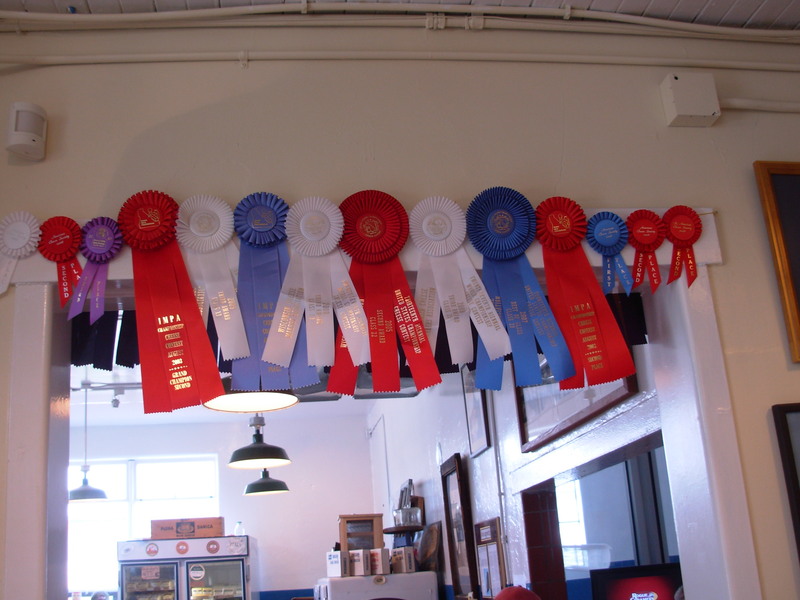 In addition to the traditional dairy states — Wisconsin, California, Vermont, New York — that are associated with award-winning cheese, Fletcher noted that ACS ribbons were spread around to some relative newcomer states, like Colorado, Indiana, Iowa, Maine, Massachusetts, Michigan, Missouri, Texas and Utah. 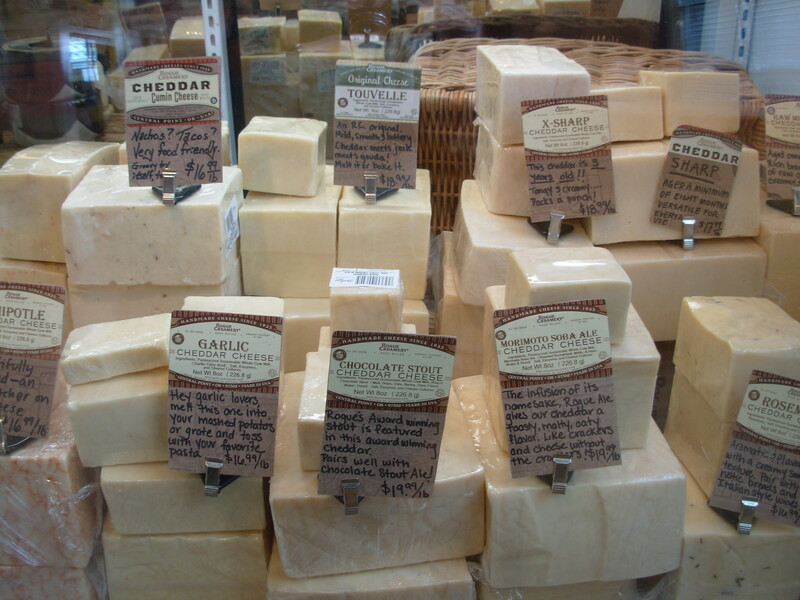 Good news for U.S. cheese production (and enjoyment)? One can only hope. Posted in Butter and Egg, Slow News, Sustainability, Who Moved My Cheese? It would be achievement enough to be crowned Best Blue Cheese, but the Rogue River Blue from Rogue Creamery in Oregon did even better, winning Best of Show at the 26th annual American Cheese Society competition, which was held recently in Austin, TX. The blue cheese beat an astonishing 1,326 other entries in what is often billed as “the Super Bowl of cheese”. 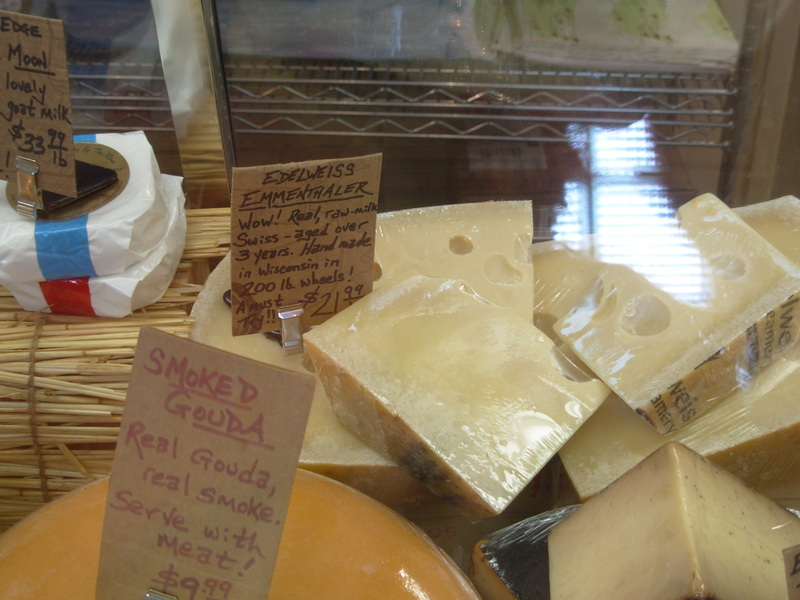 Cowgirl Creamery, in Point Reyes, CA, took Second Place in the competition, for its superb Red Hawk washed-rind cheese. Days before the win, we visited Rogue Creamery in Central Point, OR, on our return from our road trip between San Francisco and Portland. We got a chance to chat with talented and passionate cheesemonger Tom Von Voorhees and to taste tons of special, hand-recommended cheeses. The blues were indeed a highlight, and we had many generous samples. Choosing a favorite was immediately impossible — it was always the last cheese tasted. 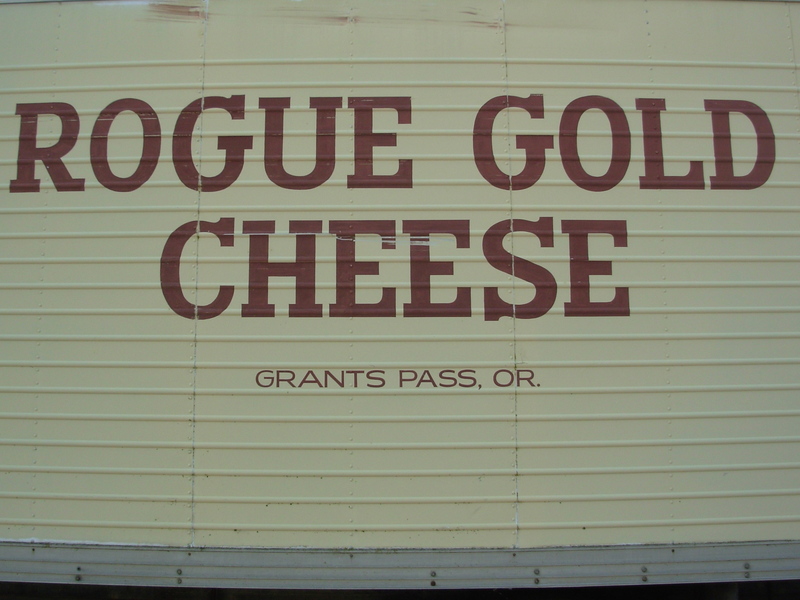 The Oregon Blue, made with raw milk, was robust, bright and creamy, with lots of wonderful classic roquefort taste. The Oregonzola was also very tasty and had a harder texture. If pressed, I’d say my favorite was the Crater Lake Blue, which was very creamy, with an even stronger and more complex blue flavor than the others. They’ve all won their share of awards. The new Caveman Blue, below, was also outstanding and flavorful and extremely creamy. 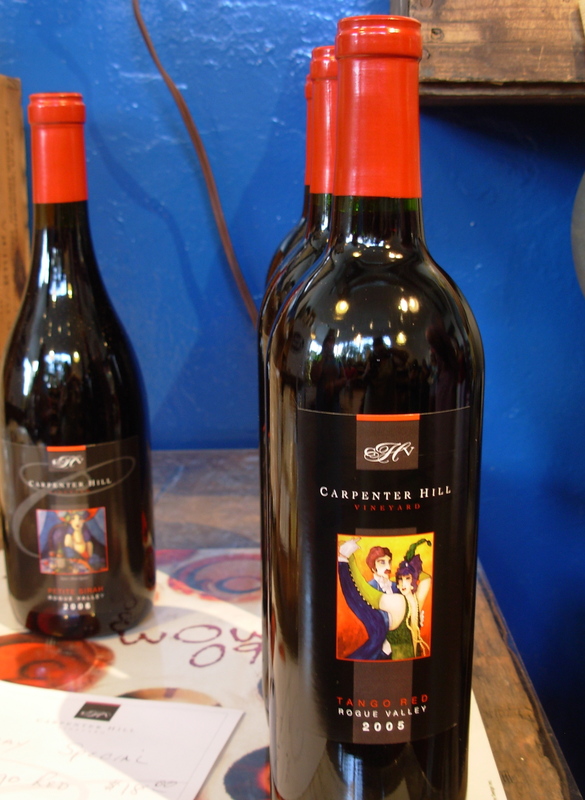 Along with the cheese tastes, we enjoyed splendid Carpenter Hill wine from the nearby Carpenter Hill Vineyard. We especially liked the Tango Red, a warm, fruity mix of merlot and cabernet, and bought some to take home. Syrah leaves from Carpenter Hill are used to wrap the Rogue River Blue for aging up to one year. Lee Mankin from Carpenter Hill explained how the Syrah leaves are macerated in Clear Creek Pear Brandy made from locally picked pears, so that the cheese is a complete example of local terroir. We moved to the cheese counter, where we got talking to Tom about all things life and cheese, and we never tasted the ACS award winner! Based on the array of Rogue Creamery blues, it has to be terrific. I can’t wait to try it. 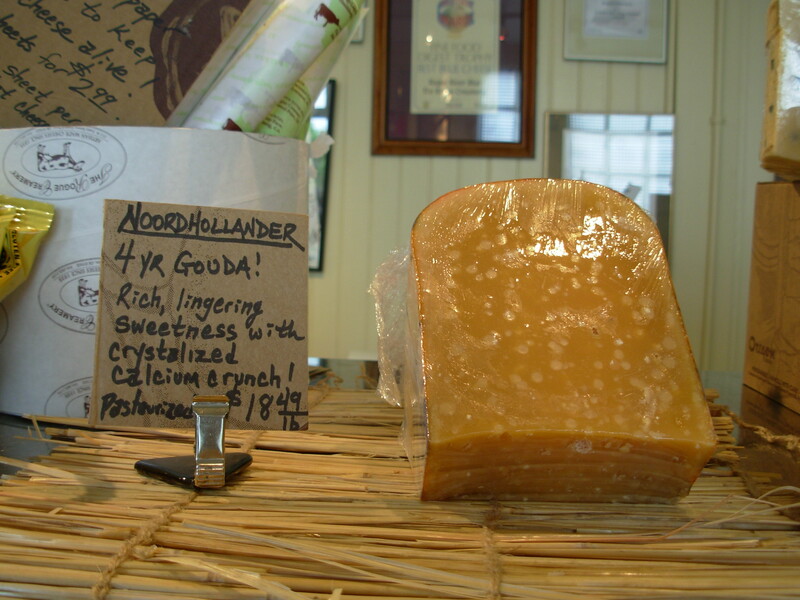 We first tried the 4-year Noordhollander Gouda, which offered an extremely tasty mix of caramel sweetness and tangy bite, along with a wonderfully rich, crunchy texture. We really enjoyed Pholia Farm’s Pleasant Creek and Covered Bridge goat cheeses, which are made locally in Rogue River, OR. Both had a superb, strong goat taste and, were we not traveling by car in a heat wave, we would have picked up a bunch. 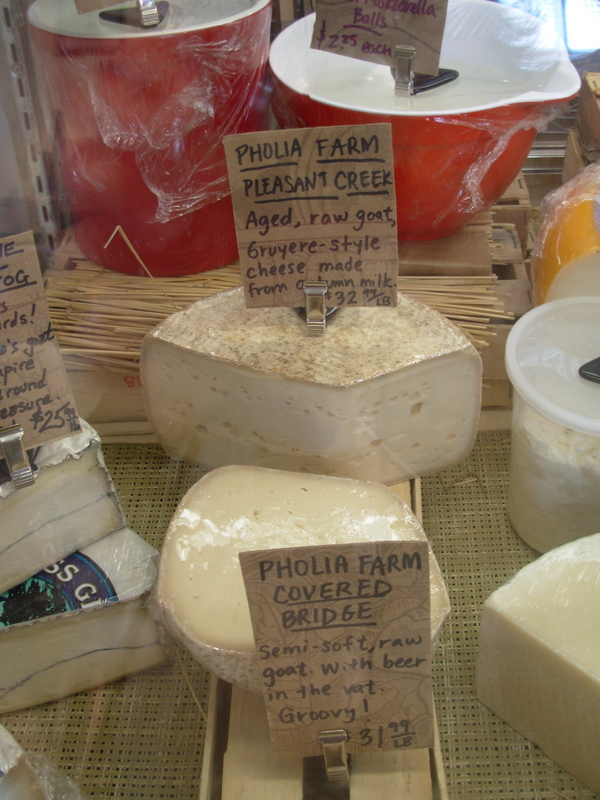 If you are lucky enough to live near Pholia Farm, they offer farm tours and cheesemaking classes. 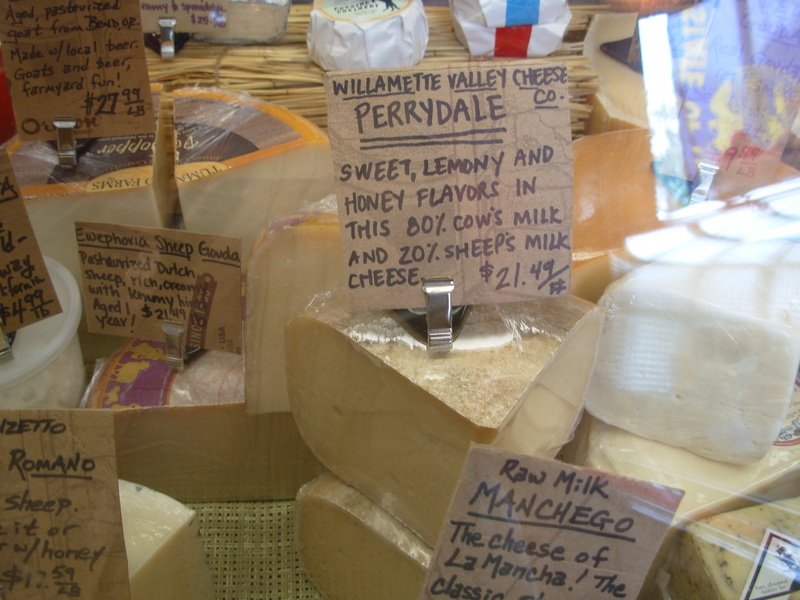 From the Willamette Valley Cheese Co. in Salem, OR, comes this Perrydale cheese, a cow/sheep mix that was wonderfully sweet and delicately fruity. We were very impressed with this raw-milk Emmenthaler from Edelweiss Creamery in Wisconsin. It had a terrific taste and is made the traditional way in huge copper vats. I must mention that Rogue Creamery is also known for its cheddars. I was personally nearing my limit — Yes, there is one — so I didn’t cheddar up, but here’s a sampling, along with Rogue’s famous curds, which are very good, and the Caveman Blue. We snapped up some curds and the hardest (hardiest) cheese for the journey, along with some Rustic Bakery crackers, which come from our home county of Marin. They are extremely tasty. We first encountered them at a local Wine and Gourmet event, and fell in love. Rustic’s flatbreads were originally created specifically to compliment the complex cheeses being produced by artisan creameries. 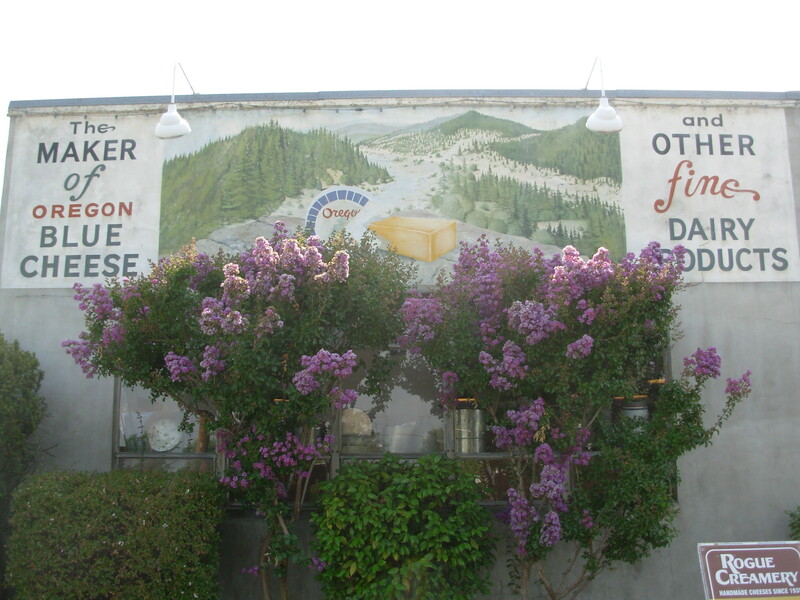 Rogue Creamery was started in the 1930s by Tom Vella, of Sonoma, CA’s Vella cheesemaking family. 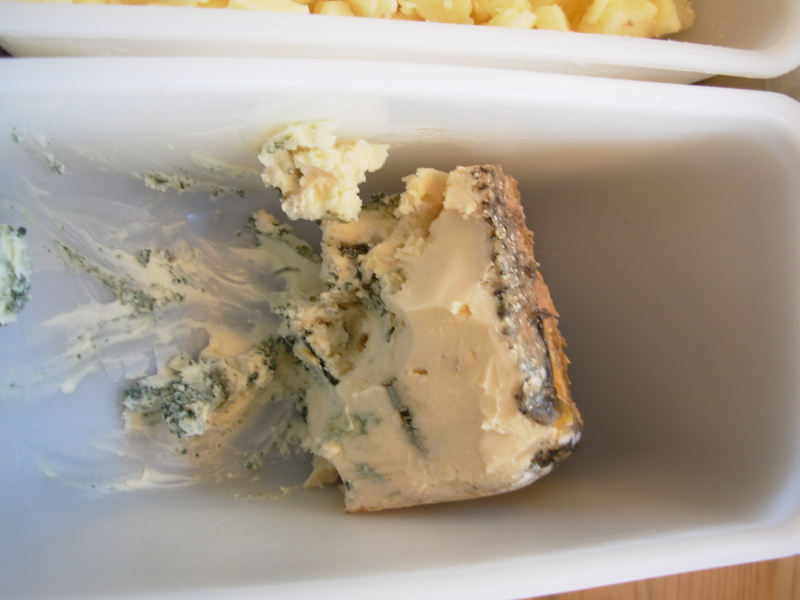 He learned blue-cheese-making techniques in Roquefort, France, and in 1957, produced the first cave-aged Blue Cheese west of the Missouri River. I was very enamored with both the creamery and the picturesque Rogue River Valley and plan to return to sample other local artisan foods. Congratulations again, Rogue Creamery, on your most impressive win. Posted in Butter and Egg, Field Trip, Road Trip, Slow News, Sustainability, To Market, Who Moved My Cheese? In a world in which many cheeses are easy to eat, this one is especially pleasing and delightful. I practically dare anyone not to like it. (A cheese gauntlet.) And, yet, it’s by no means bland. In fact, it’s quite flavorful — sweet and nutty, with hints of caramel, vanilla and flowers. The flavors are not bold or overpowering; Rather they are subtle and complex. The taste lingers nicely in the mouth, and even invokes a little extra tang after a moment. 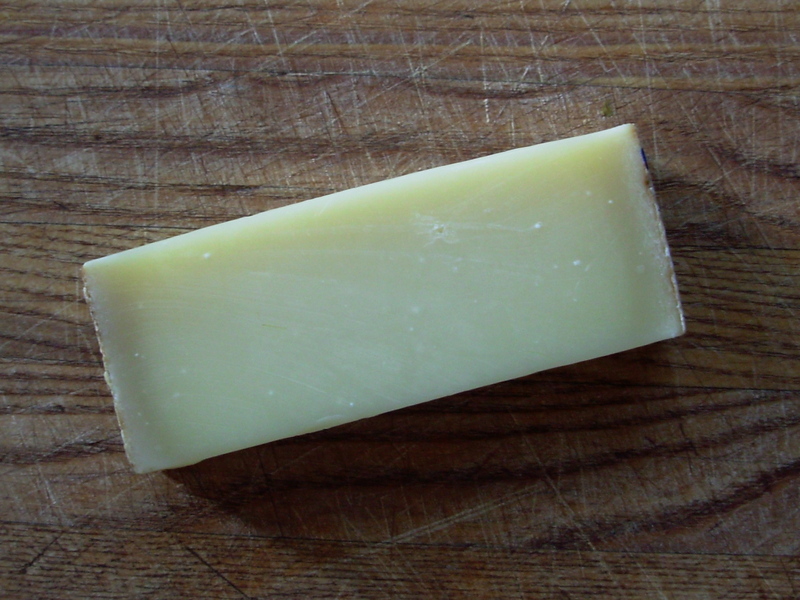 The Comté has a great mouth feel, too. It’s buttery, without being overly soft. This all makes for a very likable package. A true terroir cheese, Comté is made by the Les Trois Comptois cheesemakers in the Jura mountains of eastern France, an area of rolling hills and plateaus on the Swiss border that is also known for its wines. (The region is also called the Franche-Comté.) 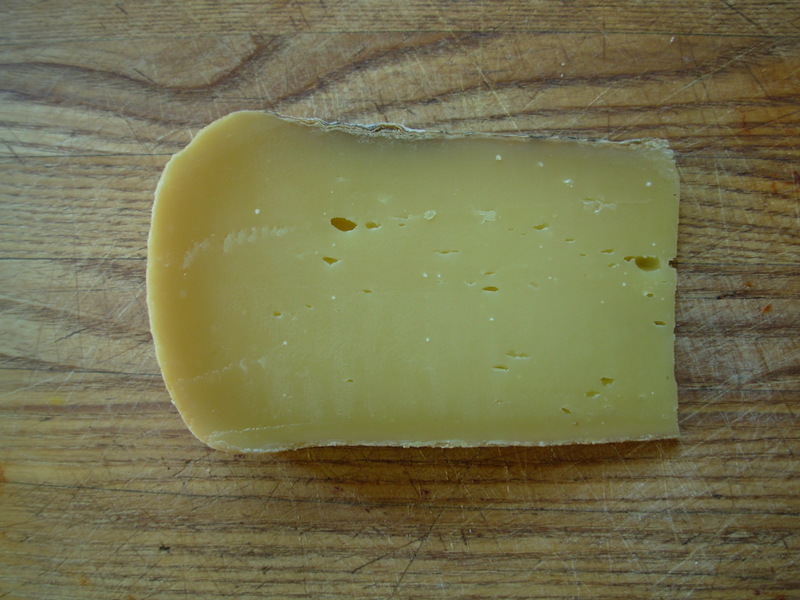 The Comté is one of the 40 or so (out of 500) French cheeses which get to bear the designation, “AOC”, or “Appellation d’Origine Contrôlée”. This means that the cheese was made in a specific region, using local cows and codified production methods. It’s fun to know that those were Jura Mountain flowers I was tasting. The Comté has certainly earned its AOC: It’s an ancient cheese that’s been in production since the time of Charlemagne. 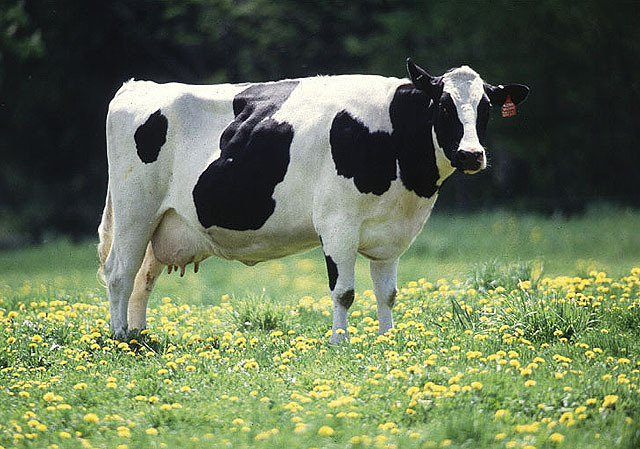 It’s made from the milk of just two types of cow — Montbeliarde and Tachete de L’est. And it endures a long maturing period (called “affinage”), in which it is cleaned and rubbed with salted water. 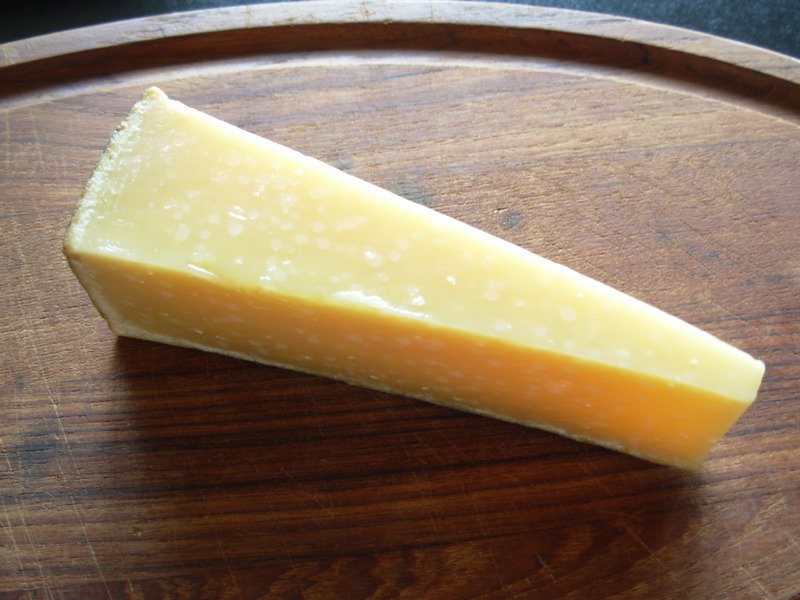 Comté makes a great nibbling cheese, or a welcome addition to a cheese plate. It works with a variety of nuts and fruits. A Jura wine would make an excellent pairing. Short of that, a dry white or a light red, like a Beaujolais, would be lovely. Posted in Butter and Egg, Who Moved My Cheese? One look and you can’t fail to notice the protein crystals on this amazing cheese. It’s got them all right, and from the first bite on, the Mossfield Farm 12-month Organic Gouda has everything else one could want in a gouda-type cheese. It’s a flat-out fantastic cheese. First, this Irish cheese has a superb, rich taste. There’s not a lot of added culture, and you can taste that, too. It’s bursting with a complex flavor that contains hints of caramel, cherry, nuts, and earth. It is tangy, with a hint of sweetness. The mouth feel is very smooth and a little buttery. And the taste just goes on and on. Mossfield Farm engages in small production, from a single cow herd. The County Offaly farm, run by the Haslam family, has been organic for 10 years. 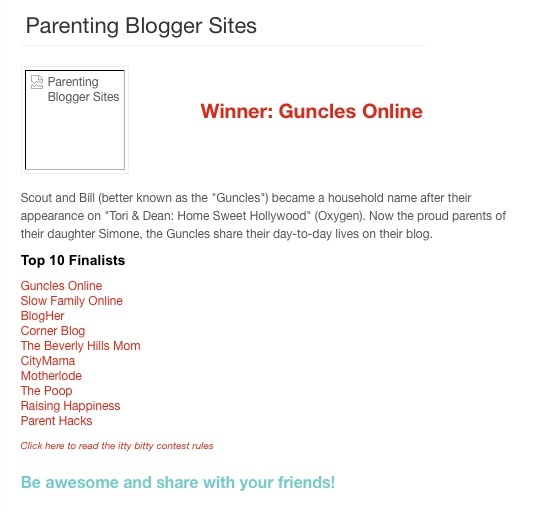 They’ve already won a bushel of awards. They just do what they do exceedingly well. This is a cheese to savor. I wouldn’t pair it with another cheese, or much else. It doesn’t even need a cracker. You may want to visit a grape, cherry, almond, or dried apricot between delicious bites, but you’ll be back. The strong taste and caramel overtones do beg for a big red wine, such as an oaky Zinfandel or a Cabernet. If you are a port drinker like me (or even if you’re new to port), try the Mossfield with a rich, tasty, special bottle like Dow’s 20-year Tawny. 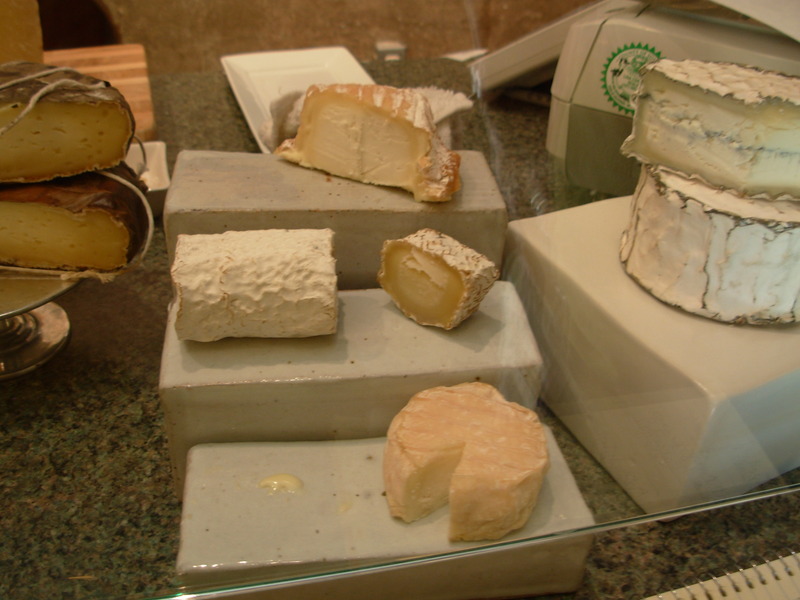 Just last week, I breathlessly reviewed Pug’s Leap’s Farms’ outstanding goat cheeses, the Pavé and the Petit Marcel. Pug’s Leap, founded by ex-San Franciscans Eric Smith and Pascal Destandau, is notably dedicated to slow food and sustainable practices. And did I mention that their cheese is out of this world? You really can taste the careful hand-crafting. Wonderfully, filmmaker Alexandra Austin has also discovered Pug’s Leap, and she is in the process of creating a documentary about Eric and Pascal’s move from corporate San Francisco to their rural Sonoma goat farm. The film is called “Leap of Faith”. Woven throughout the mens’ personal story are the issues of slow food, small farms, and sustainable businesses. John Raymond (Raymond & Co. Cheesemongers) and others are interviewed in the film. “Leap of Faith” is, at heart, the story of finding meaning in one’s life, something that seems to drive many to the land and to living locally. Filming is completed, as is some of post-production but, as we know, filmmaking is an expensive endeavor, and more funding is needed to get the job done. There have been many in-kind donations and deferrals from musicians and editors because so many people believe in this project. Alexandra is hoping to finish production in time for a pre-set premier on September 19. You can see a clip of this wonderful film-in-progress and learn more about it here. Contributions to the film are tax-deductible and no donation is too small. In addition to creating “Leap of Faith”, the filmmakers are working with the Farm to Consumer Foundation and plan to use the film to raise awareness of Congress’ over-regulation of small farms like Pug’s Leap. I wish Alexandra all success in funding, completing and distributing “Leap of Faith”. I want to see it at film festivals! Pavé is topmost, and the Petit Marcel is at the bottom. I recently had the privilege of visiting Raymond & Co. Cheesemongers in Glen Ellen, CA, and partaking in a little tasting. Yum! Everything they offered was tantalizing and top-of-the-cheese-game, including two farmstead goat cheeses, the Pavé and the Petit Marcel, from the relatively new Pug’s Leap Farm in Healdsburg. Pug’s Leap, founded by ex-San Franciscans Eric Smith and Pascal Destandau, is notably dedicated to Slow Food and sustainable practices. They have stated that “buying locally brings health, economic, environmental, and social benefits to the community.” Their single goat herd of Saanens, Toggenbergs, Sables, and some cross-breeds, is fed organic feed. Their cheese production is relatively small-scale and done largely by hand. The farm is solar-powered. The Pavé is unusually dry in texture, especially for a goat cheese. It’s extremely flavorful — tangy, with strong goat tones and smells, earthy, ashen and mushroomy. The complicated flavors linger nicely on the taste buds. The wrinkled rind is wonderfully bloomy and the cheese nearest the rind has a great gooey texture. The processes used at Pug’s Leap greatly influence the Pavé’s taste. For one, the fresh curd is treated gently, to produce a rind with external mold, which in turn influences the taste of the ripening cheese. To create the especially dry texture, the whey is expelled. The Petit Marcel is another winner. It also has a great goat flavor and an even more pungent goat nose (which I like). It’s also dry in texture, though less so than the Pavé . The younger Petit Marcel is sweeter and milkier than the Pavé. The taste, while great, is ultimately less complex, less special, than the Pavé. As for pairing, both cheeses are wonderfully versatile. Grapes, peaches and cherries are some fruits that work with them. Almonds make a nice accompaniment. The stronger Pavé can take Cabernet and other red wines. I’d stick with a fruitier Syrah or Pinot, or a Chardonnay for the Petit Marcel. Either way, get yourself a little goat round and enjoy! Posted in Butter and Egg, Slow News, Sustainability, To Market, Who Moved My Cheese? This is a fantastic Parmesan-style cheese, perhaps all the more because it’s made in Wisconsin, rather than Italy. According to the Huffington Post, it was recently named Best Cheese in the U.S. in the 2009 Championship Cheese Contest. It’s easy to see why. The SarVeccio grates beautifully and has a wonderful, distinctive Parmesan taste that is great plain and can also hold its own in many dishes. The taste is at once sweet, salty and nutty, and the cheese has a nice crystally crunch. Sartori is now in its third generation of cheese producers. The company patriarch, Paul Sartori, hailed from Valdastico, Italy, not far from the cheese-town of (and producers of the parmesan-like) Asiago. It was his dream to bring Italian cheesemaking methods and tastes to America. Wisconsin Master Cheesemaker Larry Steckbauer has been at the helm of the company’s Parmesan operation for some time. A lot of processes are carefully cultivated and unique to SarVecchio. The cheese is washed with olive oil and aged a long 20 months. The milk is from local cows. In addition to being the perfect grating cheese for pastas, salads and soups, SarVecchio also makes a nice dessert or munching cheese, and works with dried fruit, flavorful wine, or sherry. As a bonus, it is fairly reasonably priced, when compared to other Parmesans or grating cheeses. 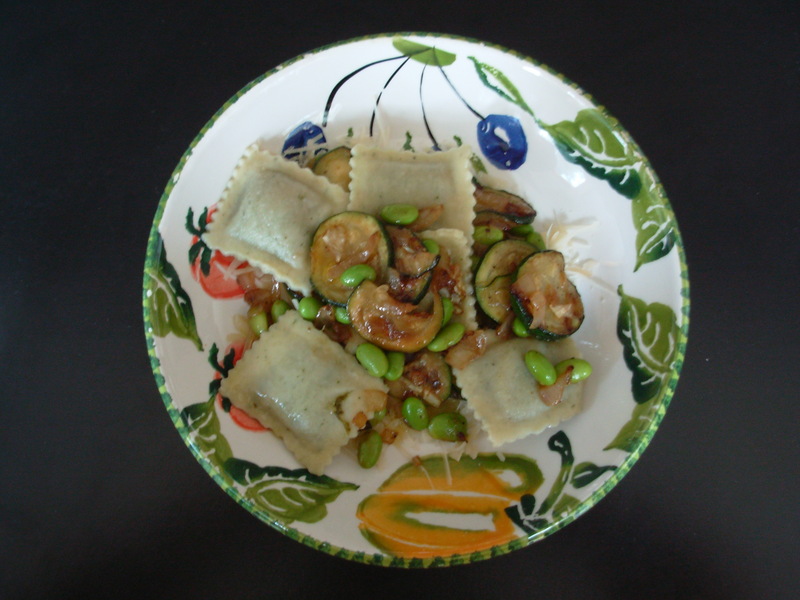 We recently grated some SarVecchio over a dish of lemon-ricotta ravioli, with olive oil, super-thin zucchini slices, and soybeans. Yum! This is a nice gouda-type cheese in the same family as one of our regular purchases, Sankaenter. In fact, Hirtenkase could be Sankaenter’s older, more serious brother. The cheese is a hard worker — it’s hard in texture, in fact and a bit dry. It’s dotted with protein crystals, which lend the texture some crunch. A bit of oil pleasantly coats the mouth, before a caramel undertone, and even a hint of flowers, catches up to the sharp, salty crunch. So why do I find this cheese serious? A solid cheese, it gets the job done, without fooling around, without frivolity. The flavor is relatively strong and especially consistent. It doesn’t veer off into surprising places. Hirtenkase is more Journeyman than Drama Queen. Hirtenkase literally means “herdsman’s cheese”. After bringing their cows into the Alps each spring to graze, Southern German cow herders traditionally bring them back down each fall — In the case of Hirtenkase, they come back to the Allgau area, near the Austrian border. Wonderfully, the cows’ mid-September descent down the mountains is marked with a festival for which the cows are adorned with flowers, and people along their route gather and cheer. 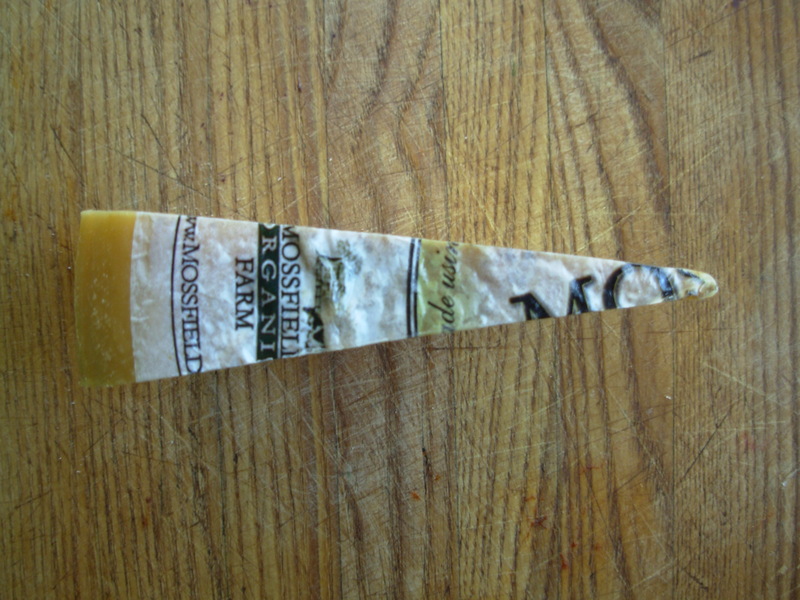 Aged eight months, Hirtenkase’s hard texture and good flavor make it a nice grating, as well as snacking, cheese. Its slight salty taste could take a fruity wine to compliment it. The strong taste and caramel-ly aspect work well with ale and good pretzels. Come mid-September, I’ll be eager to celebrate.